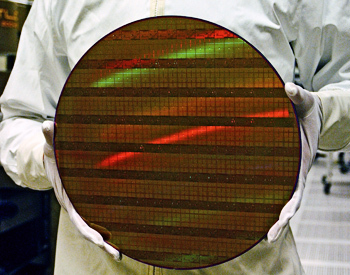 Applied's machines subject silicon wafers (such as the Intel wafer shown below) to incredibly intense vacuums, caustic chemical baths, high-energy plasmas, intense ultraviolet light, and more, taking the wafers through the hundreds of discrete manufacturing steps required to turn them into CPUs, memory chips and graphics processors. Because those processes aren't exactly friendly to humans, much of this work happens inside sealed chambers where robot arms move the wafers from one processing station to another. The machines themselves are housed within clean rooms whose scrubbed air (and bunny-suited employees) keep the risk of aerial contamination low: A single dust particle from your hair is all it takes to ruin a CPU that might sell for $500, so companies are eager to minimize how often that happens. 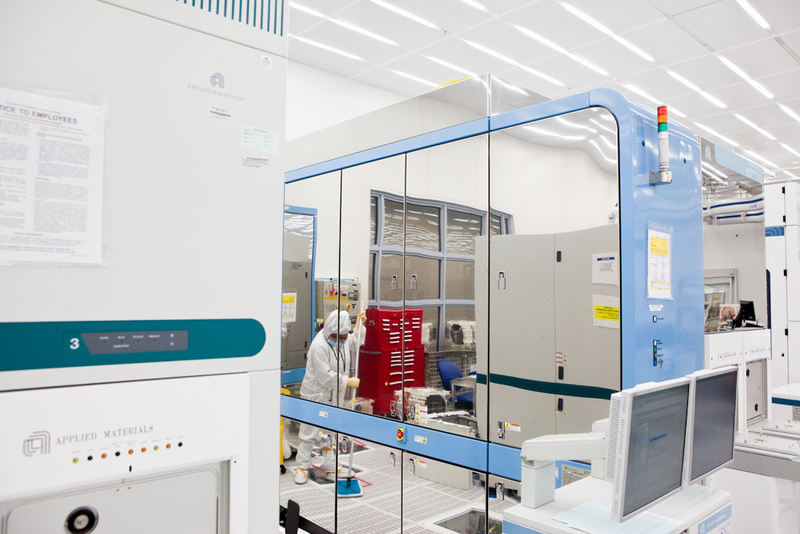 Wired/com recently toured Applied Materials' Maydan Technology Center, a state-of-the-art clean room in Santa Clara, California, where Applied develops and tests its machines. Its 39,000 square feet of ultraclean workspace equals about 81 yards of a football field, and is divided into three huge "ballrooms," each of which is crammed full of Applied's multimillion-dollar machines, alongside pipes, tubes, spare parts, tanks of caustic chemicals, Craftsman tool chests and huge racks of silicon wafers. To get inside, you must suit up in a bunny suit, with a face mask and goggles, two pairs of gloves, and shoe-covering footies. We couldn't even take a reporter's notebook inside: Instead, Applied's staff gave us a shrink-wrapped, specially sanitized clean-room notebook and clean-room pen to use. It's not a manufacturing facility. Instead, this clean room simulates the fabs where Applied's machines will be used, enabling the company (and its customers) to test out new techniques and processes before putting them on the production line. As such, it provides a rare glimpse inside the world of cutting-edge semiconductor manufacturing.